Pope John Paul II in Berlin, Germany, in 1996. He will be beatified in Rome on Sunday. Rome (CNN) - The beatification of Pope John Paul II this Sunday will probably be the biggest event in Rome since his death in April 2005, with at least 300,000 people expected to turn out for the ceremony and more than 2 million to take part in beatification-related activities in Rome, including a vigil service on Saturday in Rome’s Circus Maximus and visits to John Paul’s tomb. Beatification is the next-to-last step in the sainthood process. It means the candidate can be referred to as “blessed,” and that one miracle has been confirmed in his or her name. Another miracle is required for canonization, the formal act of declaring someone a saint. The actual number of saints is impossible to calculate. One well-known work called "Lives of the Saints" lists 2,565 Catholic saints but that doesn’t count thousands of others celebrated in local regions all over the world. The Catholic Church has a feast, All Saints’ Day, on November 1 to honor the countless saints who aren’t formally canonized. So how does one become a saint? In one sense it’s a democratic process, beginning with a grassroots conviction that a given person lived a holy life. From there, things unfold in three stages. First, Church officials make a study of the person’s life. In John Paul’s case, a four-volume study stretching over more than 2,000 pages was produced, including testimony from more than 100 witnesses. Next, one miracle after the candidate’s death is required for be beatification - and another for canonization. Usually the miracles are healings, which must be instantaneous, permanent, and complete, in addition to scientifically inexplicable. Catholics see the miracle as God’s seal of approval, a way of verifying that the saint really is in heaven. As pope, John Paul II made the sainthood process faster and simpler – but it’s still not cheap. The biggest expenses are usually the ceremonies for beatification and canonization. When St. Josemaría Escriva, the founder of Opus Dei, was canonized in 2002, Opus Dei estimated that it had spent roughly $1 million on the process from beginning to end, stretching over three decades. 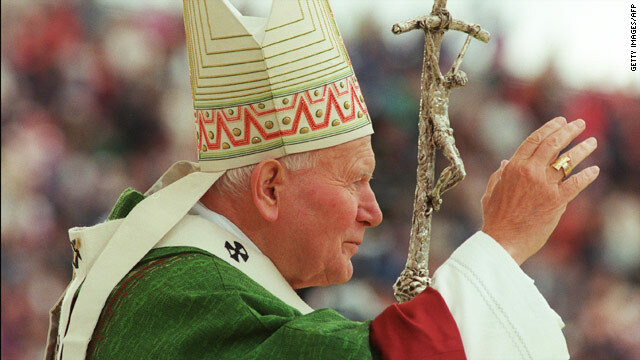 Why the rush to beatify John Paul II? John Paul’s beatification is the quickest in modern times, made possible because Pope Benedict XVI waived the normal five-year waiting period after death to get someone’s beatification rolling. Benedict was responding to crowds who chanted “Santo Subito!” (Sainthood Now!) at John Paul’s funeral Mass and to a petition signed by the cardinals who elected Benedict. In one way, the pace of John Paul’s cause is a result of his own policies. He sped up saint-making in 1983, a move meant to lift up contemporary role models of holiness. Since then, at least 20 candidates have been beatified within 30 years of their death. For the record, John Paul’s is not the most “fast-tracked” sainthood of all time. That distinction belongs to St. Anthony of Padua, who died in June 1231 and was canonized less than a year later. What was John Paul’s miracle? It concerns a 49-year-old French nun, Sister Marie Simon-Pierre Normand, who was diagnosed with Parkinson’s disease in 2001 and whose religious community prayed to John Paul II after his death. After writing the late pope’s name on a piece of paper one night, Sister Marie-Simone reportedly awoke the next morning cured and was able to resume her work as a maternity nurse. The miracle has a poetic arc, since John Paul also suffered from Parkinson’s. Last year, media reports implied that the sister had fallen ill again and that a physician had questioned the diagnosis of Parkinson’s disease. The Vatican resolved those doubts to its satisfaction, as the miracle was approved by its panels of medical and theological consultants. Sister Marie-Simone will attend the beatification ceremony in Rome this weekend. Why was John Paul II such a significant pope? Tradition recognizes 264 popes since St. Peter, described in the Bible as the leader of the disciples of Jesus and regarded by Catholics as the first pope. Only a handful of popes, however, have left a deep mark on history, and John Paul II belongs on that list. He played a key role in bringing down Communism, made 104 foreign trips and is commonly regarded as having been seen in the flesh by more people than any other figure in history, and improved ties with Judaism and Islam. Internally, John Paul II reenergized Catholicism, inspiring a “John Paul generation” of young lay people, priests and bishops. Some commentators have suggested that he will be remembered as John Paul the Great. That said, there is debate over some aspects of John Paul’s record, including his handling of the Catholic sexual abuse crisis. Officially, the Vatican insists that beatifying and canonizing a pope is not the same thing as endorsing every decision of his papacy. Instead, it means that despite whatever failures occurred, the pope was nevertheless a holy man. What’s the next step in making John Paul a saint? Officials will begin looking for that aforementioned second miracle. If one is approved by the Vatican and by the pope, John Paul II could then be canonized. It’s not clear how long that might take, but there doesn’t seem much suspense about the eventual result: Sooner or later, the Church will add “St. John Paul II” to its list. I think this website holds very great composed subject material blog posts. canada goose sale canada goose sale online cheap Cincinnati Bengals jerseys mens tall ugg boots That said, understanding these new restrictions can be a bit problematic. For instance, are you allowed to carry a bowie knife aboard a plane? You might be surprised by the answer to that question – yes, you can. However, you'll have to follow some special rules setup by the TSA to maintain safety aboard planes. NFL Jerseys nfl football jerseys cheap Nottingham is one of the biggest creative hubs in the UK, boasting an inventive past including the Lace Market, wool making and the textile industry. Graphic designers can gain their inspiration from Nottinghamâ€™s varied culture including architecture, heritage, events, fashion and festivals. Creativity can be seen everywhere from food through to landscape making Nottingham a very inspirational place to be. I don't look down on any religion, but this totally sounds confusing. With one simple question I wish I could pose to all .. Why worship or praise a person , a human being , and give no regard to the Creator. Whether it be Christian , or Hindu, or Jewish , whatever ., You hear everyone saying do good things , do this and do that.. and there is little or no reverence to God, the Creator. The one who gives and takes away life. If you were stricken with calamity or hardship the first person you seek is God , right ? But no , why not at that time you ask the Pope , or Jesus (pbuh). These are good people , and Jesus was one of the greatest messengers of God, and let it be at that. When people started splitting people into threes and making things more than they are., this is what they come up with confusion. Again , I say , Worship the Creator, not the Creation. How gullible can people get, celebrating a man who wears your money as clothes and uses your kids for pleasure. Cured a woman of a misdiagnosis after he died? They fooled you into believing that? Ally churches are an AFRONT to creation, and they should all be torn down, sold and proceeds donated to those truly in need. Old white men, loving in palaces adorned with Gold? While the people go hungry and broke? When are we going to see some arrests? The fact this page is called "belief" is no accident. Faith is believing in what cannot be seen, but only felt by the believer(s). Personally, I feel that Christianity in its truest form is a beautiful religion, notwithstanding the violence of the Old Testament. To me, Jesus was a beautiful example of the human spirit – the best within all of us. I for one wish I could be more like him. Like most of us, I question the existence of a god. Honestly, for some time now, I have given up my beliefs in god, and have almost entirely lost faith in the church. But I realized that one does not need to follow a religion, or even believe in God, to hope and believe in the beauty and awesome potential of the human spirit, exemplified by a man called Jesus. That's not hypocrisy; it's simply recognizing and appreciating wisdom when one finds it. Wishing to be more like someone who one admires is not insanity; it is not fairy tale or nonsense; on the contrary, it is a normal characteristic of human nature. And if one chooses to believe in deities, and to practice a religion, you do not have to agree. You do not have to like it. You can feel any way about it you wish. But please, if you wish to be respected by others, be respectful of others, not necessarily for what they believe, but rather for the right of us all to believe in whatever we wish. He should get a negative for his treatment of Bishop Romero, essentially giving the death squads a moral pass for his murder. John Paul was Polish. He's more than our national treasure. Get stuck up your local priest. lmao He miracuously cured a misdiagnosis. Seriously? Fugazi Pope is a Fugazi Saint. Really?! This is 2013 and we're discussing miracles and saints. Are we still in the dark ages? Someone wake me up and tell me it was a bad dream and that nobody really believes in saints, God, the devil, the Tooth Fairy, Bilbo Baggins, Harry Potter, etc. Get real and spend your time and efforts on reality, not fantasy! There are plenty of good causes which could use your time, your kindness and your help. @CD Mindless? Spending our time on reality, on this earth, right now, is mindless? Kindness is mindless? Spending our time on good causes is mindless? Challenge his intellect? Sorry brother, but science is rational and logical which requires more intellect than fantasy religion. Good deeds are most important on this earth. I want to do good on this earth to help others and not only to please a "higher power" but rather to please those who need it and are less fortunate. When you know you know. Argue for your limitations and they will be yours. God's gift to us is thought. Think good ones – these are prayers. Try negative thought, but not for too long, as you will see the power in that also. In order to change the world you have to change your mind, I recommend it. Imagine, rewarding this charlatans, who did nothing but help coverup pedophilia. What about the tens of thousands of children abused by priests during the years he was pope, and he supported a system keeping the abuse hidden? What role does the truth have in the sainthood process? I think about, that you are mistaken. Let's discuss. Write to me in PM.